I don’t think there is any chance Llorente starts. At least I would be very very surprised if it happens. Deep down, Hala knows that line up is not gonna happen vs Espanyol. Hell, that line up is a recipe for a 2-0 loss and everyone calling for Lope's head. The man is, more than likely, gonna play a strong XI because we need 3 points in La Liga as Barcelona still has that "play poorly but still win anyway" vibe about them. 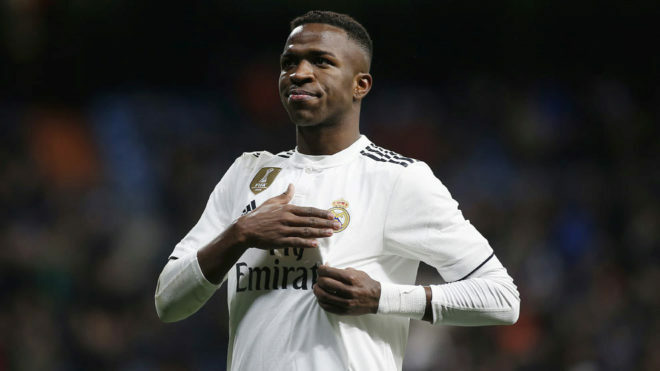 Vinicius will make his debut today. It's interesting to see Lopetegui's strategy to introduce new players. He essentially went with last year's team for the start of the season, 4-5 games. Ceballos is the first who got into the rotation to play a bit more. Then it was Courtois. Now we have played enough games to have a basis, so to speak, and Odriozola is going to come in, along with Vinicius. Goalkeepers: Keylor Navas, Kiko Casilla, Courtois. Defenders: Odriozola, Sergio Ramos, Varane, Nacho, Marcelo. Midfielders: Modric, Casemiro, Marcos Llorente, Asensio, Isco, Ceballos, Valverde. Forwards: Mariano, Benzema, Bale, Lucas Vázquez, Vinicius. No Carvajal or Kroos. So Odriozola and Ceballos are definitively starting. Or Nacho and Isco with Asensio. Llorente and Fede have to start getting minutes for their own good already. @sportsczy wrote: Or Nacho and Isco with Asensio. Courtois; Odriozola, Varane, Ramos, Nacho; Modric, Casemiro, Ceballos; Isco, Benzema y Asensio. @halamadrid2 wrote: Courtois; Odriozola, Varane, Ramos, Nacho; Modric, Casemiro, Ceballos; Isco, Benzema y Asensio. Zidane had an unhealthy obsession with that hack. Incredible how he got that much love from him. Lucas could stay on the bench to all I care, his usefulness has kinda reached its limit. Seeing how Real Madrid and Espanyol players are greeting each other, I think we paid them off lol. He has been called up regularly on Spain NT. Lol, hahaha, well, to be fair, some of them were part of the club at one point. I hope we finish better in this game. It was shameful against Roma. Have only started watching since the '33rd minute. Overall, we're less fluid than we were against Roma, but it's understandable since Lopetegui rotated a lot. I'll have to watch the entire second half to have a better and more accurate assessment. No wonder Carvajal up his game, Odriozola looks like he can very much be a starter for us. Anyway, a hard half for Madrid as Espanyol are definitely up for this. Imagine if Lope started that cancer side Hala posted, uff, would not have stopped cursing.